Music is a bridge for communication when those of different cultures are unable to understand each other. The art of learning music is both a privilege and a lifelong commitment. Composers have been standing role models for centuries, impacting students and teachers in their musical journeys. It is always amazing how a person can feel a mix of different emotions, such as passion, sadness, and joy all in one song. Students who are learning the art of music are encouraged to go about their studies seriously. It should not be thought of as a hobby, or to be entered into lightly. When challenging themselves, students can learn important lessons about life. The greatest composers who ever lived encountered obstacles every day, many of which were emotional. Despite their trials, they continued to persevere and remain committed to their studies. In a world where music was being discouraged, the composers showed bravery towards their passions. There are many famous composers in the Carnatic music field. One composer in particular who has made a great impact is Purandara Dasa, also referred to as Pitamaha. He is thought to be the father of Carnatic music due to his formulations of basic lessons in Carnatic songs. Pitamaha formulated organized music exercises, such as Swaravalis and Alankaras. He also introduced the first scale to be learned by beginners, known as Raga Mayamalavagowla. For novice students, Pitahama composed “Gitas”, which were simple songs. Many years ago, the art of Carnatic music was taught in a system called “Gurukala”. This was when the students lived with their guru, or preceptor, to learn the art of Carnatic music. In our world today, students still meet with a guru on a daily or weekly basis. Even though the rules of learning have changed somewhat, the overall concept of learning music from an experienced teacher has not. It is vital to the success of a student that their parents continue to be devoted to their child’s music education. There will be events in life when dedication and perseverance will be extremely important. It takes bravery to step out of our normal levels of comfort and push ourselves farther. However, it is the challenges that teach us how to grow into the persons that we are meant to be. Many children lose patience quickly with a new task if they do not see results. Adults are similar. It is important that a parent helps steer their children in the right direction, and encourage them not to give up on their music study. The students need to see that everyone is on the same page, and to see that not only their teachers are encouraging their music, but also their parents. This should be not only visible in school but also at home. It is normal for students to want to give up if they are not learning at the same pace as their peers. Reminding them that everyone learns at a different pace is important. It also helps to assist the students with setting a goal, so that they can see a future reward for their efforts. Other than the benefits of individual musical education, the bond and relationships that a student can form from being in a choir, singing classical Indian music for example, can bring forth more positive results. It allows the children to feel as if they are part of a team and are involved in something important. This is the type of confidence that any student needs to possess in later real life events. Before a student can perform in a choir, they have to learn the specific techniques of Carnatic music. This is another reason why a parent being involved in encouraging and helping the student persevere in their learning is so important. 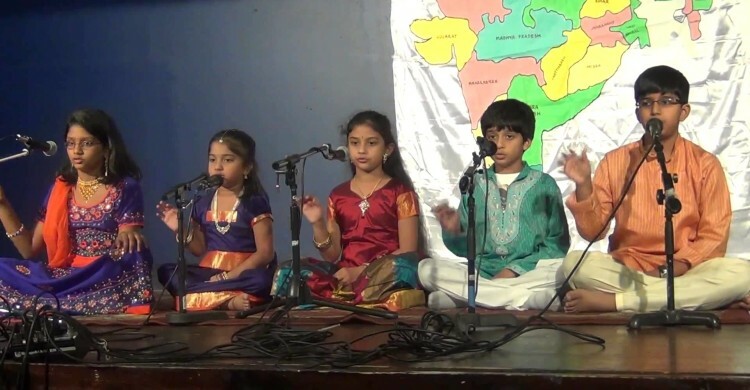 Research has shown that providing a child with classical Carnatic music training can give him advantages in pitch perception, verbal memory, and phonological awareness. Giving your child the ability to understand feelings and emotions without words is a wonderful gift. Not only will it give the student the ability to communicate with those in other cultures, but it teaches them discipline in future life events.